This article is about the film. For the song sung in this film, see Singin' in the Rain (song). For the stage musical, see Singin' in the Rain (musical). At the premiere of his latest film, The Royal Rascal, Don tells the gathered crowd an exaggerated version of his life story, including his motto: "Dignity, always dignity." His words are humorously contradicted by flashbacks showing him alongside his best friend Cosmo Brown (Donald O'Connor). To escape from his fans after the premiere, Don jumps into a passing car driven by Kathy Selden (Debbie Reynolds). She drops him off, but not before claiming to be a stage actress and sneering at his "undignified" accomplishments as a movie star. Later, at a party, the head of Don's studio, R.F. Simpson (Millard Mitchell), shows a short demonstration of a talking picture,[a] but his guests are unimpressed. To Don's amusement, Kathy pops out of a mock cake right in front of him, revealing herself to be a chorus girl. Furious at Don's teasing, she throws a real cake at him, only to accidentally hit Lina in the face. She runs away. Don is smitten with Kathy and searches for her for weeks. While filming a love scene, Lina tells him that she had Kathy fired. Don finally finds Kathy working in another Monumental Pictures production. She confesses to having been a fan of his all along. After a rival studio has an enormous hit with its first talking picture, the 1927 film The Jazz Singer, R.F. decides he has no choice but to convert the next Lockwood and Lamont film, The Dueling Cavalier, into a talkie. The production is beset with difficulties, including Lina's grating voice and strong New York accent. An exasperated diction coach tries to teach her how to speak properly, but to no avail. The Dueling Cavalier's preview screening is a disaster; the actors are barely audible thanks to the awkward placing of the microphones, Don repeats the line "I love you" to Lina over and over, to the audience's derisive laughter,[b] and in the middle of the film, the sound goes out of synchronization, with hilarious results as Lina shakes her head while the villain's deep voice says, "Yes! Yes! Yes!" and the villain nods his head while Lina's squeaky soprano says, "No! No! No!" Don, Kathy and Cosmo come up with the idea to turn The Dueling Cavalier into a musical called The Dancing Cavalier, complete with a modern musical number called "Broadway Melody". Cosmo, inspired by a scene in The Dueling Cavalier where Lina's voice was out of sync, suggests that they dub Lina's voice with Kathy's. R.F. approves the idea but tells them not to inform Lina about the dubbing. When Lina finds out, she is infuriated. She becomes even angrier when she discovers that R.F. intends to give Kathy a screen credit and a big publicity buildup afterward. Lina threatens to sue R.F. unless he orders Kathy to continue working uncredited as Lina's voice. R.F. reluctantly agrees to her demands, as a clause in her contract states that the studio is responsible for media coverage of her and she can sue if she is not happy with it. The premiere of The Dancing Cavalier is a tremendous success. When the audience clamors for Lina to sing live, Don, Cosmo, and R.F. tell her to lip sync into the microphone while Kathy, concealed behind the curtain, sings into a second one. While Lina is "singing", Don, Cosmo and R.F. gleefully raise the curtain, revealing the fakery. Lina flees. A distressed Kathy tries to run away as well, but Don proudly announces to the audience that she's "the real star of the film." Later, Kathy and Don kiss in front of a billboard for their new film, Singin' in the Rain. Gene Kelly as Don Lockwood. His performance in the song "Singin' in the Rain" is now considered to be iconic. Debbie Reynolds as Kathy Selden. Directors Gene Kelly and Stanley Donen insisted that Reynolds was always first in their minds for the role. Although the film revolves around the idea that Kathy has to dub over for Lina's voice, in the scene where Kathy is dubbing a line of Lina's dialogue ("Our love will last 'til the stars turn cold"), Jean Hagen's normal voice is used. Donald O'Connor as Cosmo Brown, Don's lifelong pal, and vaudeville partner, who becomes the head of Monumental Pictures' music department. Jean Hagen as Lina Lamont. Fresh off her role in The Asphalt Jungle, Hagen read for the part for producer Arthur Freed. She did a dead-on impression of Judy Holliday's Billie Dawn character from Born Yesterday, – for which Hagen had been Holliday's understudy – which won her the role. Millard Mitchell as R.F. Simpson. The initials of the fictional head of Monumental Pictures are a reference to producer Arthur Freed. R.F. also uses one of Freed's favorite expressions when he says that he "cannot quite visualize it" and has to see it on film first, referring to the "Broadway Melody" sequence. This is a joke, since the audience has just seen it. Cyd Charisse as the long-legged woman in the green sequined dress and Louise Brooks hair who vamps Gene Kelly in the "Broadway Melody" sequence. Rita Moreno as Zelda Zanders, the "Zip Girl" and Lina's friend. Madge Blake as Dora Bailey, a Hollywood gossip columnist based on Louella Parsons. Bobby Watson as Lockwood's diction coach during the "Moses Supposes" number. Singin' in the Rain was originally conceived by MGM producer Arthur Freed, the head of the "Freed Unit" responsible for turning out MGM's lavish musicals, as a vehicle for his catalog of songs written with Nacio Herb Brown for previous MGM musical films of the 1929–39 period. Screenwriters Betty Comden and Adolph Green wrote two entirely new songs, "Make 'Em Laugh" and "Moses Supposes", the latter with music director Roger Edens providing the music (see below). All songs have lyrics by Freed and music by Brown unless otherwise indicated. Some of the songs, such as "Broadway Rhythm," "Should I?," and especially "Singin' in the Rain" itself, have been featured in numerous films. The films listed below mark the first time each song was presented on screen. "Make 'Em Laugh," considered an original song, but bearing a striking resemblance to Cole Porter's "Be a Clown," used in another MGM Freed-produced musical, The Pirate (1948). Credited to Comden and Green. "Moses Supposes" (music by Roger Edens, lyrics by Comden and Green), based on the tongue-twister with the same title. "Broadway Melody" composed of "The Broadway Melody" from The Broadway Melody (1929) and "Broadway Rhythm" from Broadway Melody of 1936 (1935) The music for the "Broadway Ballet" section is by Nacio Herb Brown. Arthur Freed, the head of the "Freed Unit" at MGM responsible for the studio's glossy and glamorous musicals, conceived the idea of a movie based on the back catalog of songs written by himself and Nacio Herb Brown, and called in Betty Comden and Adolph Green from New York to come up with a story to tie the songs together and to write the script. Comden and Green first refused the assignment, as their agent had assured them that their new contract with MGM called for them to write the lyrics to all songs unless the score was by Irving Berlin, Cole Porter, or Rodgers and Hammerstein. After a two-week hold-out, their new agent, Irving "Swifty" Lazar, having looked over the contract, told them that the clause had been entirely an invention of their previous agent, and that there was no such language in the contract. After hearing this, Comden and Green began working on the story and script. Because many of the songs had originally been written during the time when silent films were giving way to "talkies", and musicals were popular with audiences, Comden and Green came up with the idea that the story should be set during that transitional period in Hollywood, an era they were intimately familiar with. When Howard Keel was mentioned as the possible lead, they tried to work up a story involving a star of Western films who makes a comeback as a singing cowboy, but they kept gravitating to a story about a swashbuckling romantic hero with a vaudeville background who survives the transition by falling back on his abilities as a song-and-dance man, a story which Gene Kelly was well-suited for. Kelly could not be approached at the time, as he was deeply immersed in An American in Paris (1951), which he was starring in and co-choreographing with Stanley Donen. Comden and Green continued to work on the script, and had at that time three possible openings for the film: a silent movie premiere, a magazine interview with a Hollywood star, and a star-meets-girl, star-loses-girl sequence. Unable to decide which to use or how to proceed, they had just decided to return their advance to MGM and admit defeat, when Betty Comden's husband arrived from New York and suggested that they combine all three openings into one. The script with the re-written opening was approved by Freed and by MGM's head of production Dore Schary, who had recently replaced Louis B. Mayer. By this time shooting on An American in Paris had completed, and Freed suggested that Kelly be given the script to read. Kelly and Donen responded enthusiastically, and immediately become involved in re-writes and adjustments to the script. Comden, Green, Kelly, and Donen were all old friends, and the process went smoothly. Besides the Freed-Brown songs, Comden and Green contributed the lyrics to "Moses Supposes", which was set to music by Roger Edens. Shortly before shooting began, "The Wedding of the Painted Dolls", which Comden and Green had "painfully wedged into the script as a cheering-up song" was replaced with a new Freed-Brown song, "Make 'Em Laugh". After Comden and Green had returned to New York to work on other projects, they received word that a new song was needed for a love-song sequence between Kelly and Debbie Reynolds. The original had been a song-and-dance medley involving different sets in different soundstages on the studio lot, but they were asked for a romantic love song set in an empty sound stage, and it was needed immediately. Comden and Green provided such a scene for "You Are My Lucky Star" and sent it off to Hollywood. Kelly singing "You Were Meant For Me" to Reynolds on an empty sound stage was not included in that draft. The number was originally conceived as Kelly singing a medley of other songs to her as they romped around various studio back lot sets. In the sequence in which Gene Kelly dances and sings the title song while spinning an umbrella, splashing through puddles and getting soaked with rain, Kelly was sick with a 103 °F (39 °C) fever. The water used in the scene caused Kelly's wool suit to shrink during filming. A common myth is that Kelly managed to perform the entire song in one take, thanks to cameras placed at predetermined locations. However, this was not the case; filming the sequence took 2 to 3 days. Another myth is that the rain was mixed with milk in order for the drops to show up better on camera; but the desired visual effect was produced, albeit with difficulty, through backlighting. Debbie Reynolds was not a dancer when she made Singin' in the Rain; her background was as a gymnast. Kelly apparently insulted her for her lack of dance experience, upsetting her. In a subsequent encounter when Fred Astaire was in the studio, he found Reynolds crying under a piano. Hearing what had happened, Astaire volunteered to help her with her dancing. Kelly later admitted that he had not been kind to Reynolds and was surprised that she was still willing to talk to him afterwards. After shooting the "Good Morning" routine, which had taken from 8:00 a.m. until 11:00 p.m. to shoot, Reynolds' feet were bleeding. Years later, she was quoted as saying that "Singin' in the Rain and childbirth were the two hardest things I ever had to do in my life." Donald O'Connor had to stay in bed in the hospital for several days after filming the "Make 'Em Laugh" sequence, due to his smoking up to four packs of cigarettes a day. Most of the costumes from this film were eventually acquired by Debbie Reynolds and held in her massive collection of original film costumes, sets, and props. Many of these items were sold at a 2011 auction in Hollywood. While most items were sold to private collectors, Donald O'Connor's green check "Fit As a Fiddle" suit and shoes were purchased by Costume World, Inc. They are now on permanent display at the Costume World Broadway Collection Museum in Pompano Beach, Florida. According to MGM records, during the film's initial theatrical release, it made $3,263,000 in the US and Canada and $2,367,000 internationally, earning the studio a profit of $666,000. It was the tenth highest-grossing movie of the year in the US and Canada. Bosley Crowther of The New York Times wrote: "Compounded generously of music, dance, color spectacle and a riotous abundance of Gene Kelly, Jean Hagen and Donald O'Connor on the screen, all elements in this rainbow program are carefully contrived and guaranteed to lift the dolors of winter and put you in a buttercup mood." Variety was also positive, writing: "Arthur Freed has produced another surefire grosser for Metro in Singin' in the Rain. Musical has pace, humor, and good spirits a-plenty, in a breezy, good-natured spoof at the film industry itself ... Standout performances by Gene Kelly and Donald O'Connor, especially the latter, enhance the film's pull." Harrison's Reports called it "top-notch entertainment in every department — music, dancing, singing, staging and story." Richard L. Coe of The Washington Post called it "yet another fresh and breezy, colorful and funny musical" from Gene Kelly, adding, "Of the players there's not a dud in the lot, from Kelly's facile performing to the brief but electric dance appearance by Cyd Charisse, a swell partner for him." Pauline Kael, the long-time film critic for The New Yorker, said of the film "This exhuberant and malicious satire of Hollywood in the late twenties is perhaps the most enjoyable of movie musicals – just about the best Hollywood musical of all time." Roger Ebert placed Singin' in the Rain on his Great Movies list, calling the film "a transcendent experience, and no one who loves movies can afford to miss it." On review aggregator Rotten Tomatoes, the film had a score of a perfect 100% "Certified fresh" approval rating based on 49 reviews with an average rating of 9.2/10, the website's critical consensus reads: "Clever, incisive, and funny, Singin' In The Rain is a masterpiece of the classical Hollywood musical." Betty Comden and Adolph Green report that when they met Francois Truffaut at a party in Paris, Truffaut was very excited to meet the authors of Chantons sous la pluie. He told them that he had seen the film so many times that he knew it frame by frame, and that he and fellow director and screenwriter Alain Resnais, among others, went to see it regularly at a small Parisian movie theatre where it sometimes ran for months at a time. For her role as Lina Lamont, Jean Hagen was nominated for the Academy Award for Best Supporting Actress. The film was also nominated for Best Original Music Score for Lennie Hayton. Singin' in the Rain has appeared twice on Sight & Sound's list of the ten best films of all time, in 1982 and 2002. Its position in 1982 was at number 4 on the critics list; on the 2002 critics' list, it was listed as number 10, and it tied for 19 on the directors' list. Review aggregation website Rotten Tomatoes reported that 100% of critics gave the film a positive review based on 49 reviews, with an average score of 9.2/10. The film is ranked as No. 14 on Rotten Tomatoes' list of best rated films. Rotten Tomatoes summarizes the critical consensus as, "Clever, incisive, and funny, Singin' in the Rain is a masterpiece of the classical Hollywood musical." In 2008, Singin' in the Rain was placed on Empire's 500 Greatest Movies of All Time List, ranking at #8, the highest ranked G-rated movie on the list. According to the audio commentary on the 2002 Special Edition DVD, the original negative was destroyed in a fire. Despite this, the film was digitally restored for its DVD release. A Blu-ray Ultimate Collector's Edition was released in July 2012. The Broadway musical Singin' in the Rain was adapted from the motion picture, and the plot of the stage version closely adheres to the original. Directed and choreographed by post-modern choreographer Twyla Tharp, the opening night cast starred Don Correia as Don Lockwood, Mary D'Arcy as Kathy Selden, Richard Fancy as Roscoe Dexter, Faye Grant as Lina Lamont, and Peter Slutsker as Cosmo Brown. The musical opened on July 2, 1985 at the Gershwin Theatre after 39 previews, and ran for 367 performances, closing on May 18, 1986. In the 1983 television special Paddington Goes to the Movies, the film is mentioned at some points and Paddington performs a version of Gene Kelly's famous dance from the 1952 film. In their 1976 Christmas special, the British comedy act Morecambe and Wise parodied the "Singin' in the Rain" sequence. Gene Kelly's "Singin' in the Rain" sequence was one of the opening scenes of The Great Movie Ride at Disney's Hollywood Studios. Kelly approved his Audio-Animatronics likeness prior to its delivery to Florida. The dance to the title song is parodied in the 2005 Broadway musical Spamalot in the dance break to "Always Look on the Bright Side of Life," complete with tap-dancing knights spinning bright yellow umbrellas around. The "Singin' in the Rain" sequence was featured in a 2005 Volkswagen Golf commercial, with Gene Kelly seen break-dancing in the street. Also featured was Mint Royale's version of the song accompanying the commercial. A parody of the number "Singin' in the Rain" was featured in the 2005 animated film Robots where Fender (Robin Williams) breaks out singing and dancing after dropping off a date. Instead of 'rain' he says 'oil' to fit the film's theme, and emulates Gene Kelly's iconic swing on the lamppost. Two songs from the film were featured in "The Substitute", a season 2 episode of the musical comedy television series Glee. In the 2012 film Silver Linings Playbook, Jennifer Lawrence's character is inspired by a clip of Donald O'Connor and Gene Kelly dancing to "Moses Supposes" from Singin' in the Rain. The 2013 anime short Gisoku no Moses features a young female ghost dancing with a pair of haunted dance shoes to the tune of "Moses Supposes." In the 2015 romantic drama film Brooklyn, Tony Fiorello (Emory Cohen) takes Eilis Lacey (Saoirse Ronan) out on a date to see the film. In the next scene, he emulates Gene Kelly's iconic swing on the lamppost. The scene in which Gene Kelly sings "You Were Meant for Me" is featured in the 2015 Nancy Meyers film The Intern. Singin' in the Rain was an inspiration for the 2016 musical film La La Land, directed by Damien Chazelle. The song "Good Morning" was featured in the Legends of Tomorrow season 3 episode "Phone Home". ^ This scene pays homage to the original 1921 DeForest Phonofilm demonstration, featuring DeForest explaining the system. ^ This is a reference to a scene by John Gilbert in his first talkie, His Glorious Night. ^ a b "Singin' In The Rain (1952)". ^ "The 50 Greatest Films of All Time | Sight & Sound". British Film Institute. Retrieved August 11, 2017. ^ Betty Comden and Adolph Green (2002). The story Behind Singin' in the Rain: Now It Can be Told, reprint of the Singin' In the Rain screenplay introduction, originally published in 1972, included in the liner notes of the Music from the original motion picture soundtrack (deluxe edition) Singin' in the Rain double CD by Rhino Entertainment and Turner Classic Movies. ^ Osborne, Robert. TCM commentary, "Singing in the Rain." ^ Reynolds, Debbie & Columbia, David Patrick (1989). Debbie: My Life. Pocket Books. p. 97. ISBN 978-0671687922. ^ a b c d e f g h i j k l m n Track list in the liner notes of the "Music from the original motion picture soundtrack (deluxe edition) Singin' in the Rain" double CD by Rhino Entertainment and Turner Classic Movies. ^ a b c New 50th Anniversary Documentary What a Glorious Feeling, hosted by Debbie Reynolds on the film's DVD. ^ Sanburn, Josh (December 2, 2010). "Top Ten Movie Dance Scenes: A Wet, Soft Shoe in Singin' in the Rain". Time. ^ "The Biography Channel". Archived from the original on 2015-04-02. Retrieved 2008-06-03. ^ a b "Singin' in the Rain (1952) – Hollywood's Greatest Musical!". Key Light Enterprises. Archived from the original on 19 January 2012. Retrieved 15 January 2012. ^ Bubbeo, Daniel (July 11, 2012). "Gene Kelly's widow Patricia chats about her late husband and 'Singin' in the Rain'". Newsday. Retrieved July 27, 2012. ^ The Basics: Was There Really Milk in Singin’ in the Rain? Archived 2014-08-19 at the Wayback Machine notes: "Gene Kelly himself described what happened in several interviews, including American Film (1979): 'Shooting the title number was just terrible for the photographer Hal Rossen [sic]. He had to backlight all the rain and then he had to put frontlight on the performer. That was as tough a job as I’ve ever seen, because you can’t photograph in rain and see it.'" ^ Reynolds, Debbie (2013). Unsinkable: A Memoir. HarperCollins Publishers. p. 207. ISBN 978-0-06-221365-5. ^ Patrick Perry, "ON TOUR WITH DEBBIE REYNOLDS: Feisty and Fit Actress Speaks Out About An All-Too-Common Problem - Overactive Bladder", The Saturday Evening Post, January/February 2003. ^ "Singin' in the Rain - Box Office Data". The Numbers. Retrieved 14 November 2011. ^ Crowther, Bosley (March 28, 1952). "' Singin' in the Rain,' Starring Gene Kelly, Ushers In Spring at the Music Hall". The New York Times: 27. ^ "Singin' in the Rain". March 12, 1952: 6. 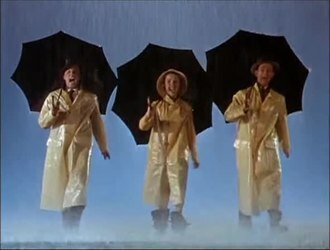 ^ "'Singin' in the Rain' with Gene Kelly, Donald O'Connor and Debbie Reynolds". Harrison's Reports: 42. March 15, 1952. ^ Coe, Richard L. (May 1, 1952). "Again Kelly Rings Those Chimes!". The Washington Post: 18. ^ Ebert, Roger (February 14, 1999). "Singin' in the Rain". RogerEbert.com. Retrieved June 21, 2018. ^ "Singin' In The Rain". Rotten Tomatoes. Retrieved 9 April 2017. ^ "wga awards". Wga.org. Archived from the original on 2006-10-01. Retrieved 2011-10-30. ^ "Sight & Sound | Top Ten Poll 2002 - Critics' top ten films of all time". BFI. 2011-08-02. Archived from the original on 2011-10-28. Retrieved 2011-10-30. ^ "Top 100 Movies Of All Time". Rotten Tomatoes. Retrieved July 24, 2017. ^ "Singin' in the Rain". Rotten Tomatoes. Retrieved May 31, 2014. ^ "Empire's 500 Best Movies of All Time". CinemaRealm. Retrieved October 30, 2018. ^ "AFI's 100 Years...100 Heroes & Villains Nominees" (PDF). Retrieved 2016-07-17. ^ a b c "AFI's 100 Years...100 Songs" (PDF). American Film Institute. Retrieved 2016-07-17. ^ "AFI's 100 Years...100 Movie Quotes Nominees" (PDF). Retrieved 2016-07-17. ^ "AFI's Greatest Movie Musicals" (PDF). American Film Institute. Retrieved 2016-07-17. ^ "VHS back cover". Amazon.com. Retrieved 2010-03-06. ^ "Movie Love #14". Grand Comics Database. ^ "On Stage: Kate Hepburn, Richard Rauh and old Nixon". Arts & Entertainment. PG Publishing Co., Inc. July 9, 2003. Retrieved February 1, 2016. ^ "Spamalot: And now for something completely silly". Retrieved 29 December 2016. ^ ""Gisoku no Moses", a delightful anime short inspired by Gene Kelly". Nerdwatch!. Retrieved 20 April 2016. ^ "'Legends of Tomorrow' Recap With Spoilers: "Phone Home"". comicbook.com. Retrieved 2017-11-05. Hess, Earl J. & Dabholkar, Pratibha A. (2009). Singin’ in the Rain: The Making of an American Masterpiece. Lawrence, Kansas: University Press of Kansas. ISBN 978-0-7006-1656-5. Comden, Betty & Green, Adolph (1986). Singin' in the Rain. New York: Lorrimer Publishing. ISBN 0-85647-116-X. OCLC 13125781. Dirks, Tim. "FilmSite Review: Singin' in the Rain (1952)". Filmsite.org. AMC. Retrieved February 14, 2016.